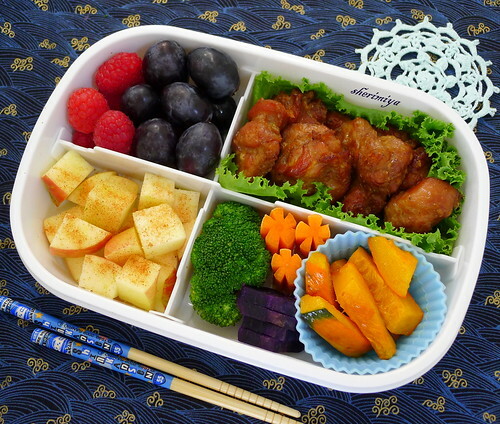 4-Section Assist Bento, a photo by sherimiya ♥ on Flickr. I packed this bento in my adjustable 4-sectioned Assist box which I found at Ichiban Kan. This is only the second time I've used it (see my other bento here). It's a nice shape and size, and the lid fits tightly with a rubber gasket and matching strap. Not sure why I don't use it more often. In one section I packed some pseudo-mochiko chicken in a lettuce leaf. This recipe is very tasty, even if it's not exactly traditional. The veggie section contains broccoli, carrots, roasted kabocha, and steamed Okinawan sweet potato. The two fruit sections contain raspberries, grapes, and cinnamon-sprinkled honeycrisp apple chunks. It might look a little big for a third-grader, but the box is on the shallow side. Also, the separate sections ensure that the foods don't mix, so it's not necessary to pack each completely full. And, everything stays put even when it's tossed around in the lunchbag. Great, right? I think it's an ideal box for a kid or an adult. Yes, I like this size and shape of the bento. The chicken sounds very good. Question, do you eat the sweet potato cold? or warm it up. Thanks Lyndsey. Yes, we eat the sweet potato cold (or actually, at room temp). It's very good either way. Wow, that looks delish! Mochiko chicken is always a hit with our family. Beautiful bento Sheri! Cool box! Reminds me of how much I loved Ichiban when they were online! Thanks Melissa! Ichiban Kan is my favorite place to shop for bento stuff; so happy they're still around here. Looks beautiful. The box is really awesome. I also love how you consciously place the veggies and meat on one side, dessert/sweet on the other. I can just imagine how amazing that crisp cinnamon apple tastes with that mochiko chicken! So yummy. It's amazing how much food actually can put inside this little bento box. I should sprinkle cinnamon on the apples. That's a great idea! 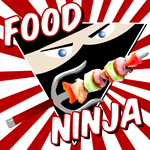 Our Cooking Channel Bento Commercials!